A truck carrying chemicals overturns on the highway, spilling its toxic load. A hurricane pummels the Gulf Coast, destroying homes, knocking out power, and leaving people unable to contact or be contacted by loved ones. A mysterious, drug-resistant strain of bacteria which at first affected only a handful of people is quickly spreading, with cases detected in several states. A camper fails to properly douse his campfire and, fanned by high winds, wildfires rampage across multiple counties. Like it or not, this is the world we live in, in which natural and man-made disasters can occur anytime. At a conference in Atlanta April 14-17, 2015, public health officials and other emergency responders from across the country were introduced and immersed in the suite of resources the National Library of Medicine has developed for disaster preparedness, response, and recovery. NLM staff, with help from the NIH Office of Emergency Management, taught several hands-on sessions at the 2015 Preparedness Summit in Atlanta, Georgia. The Preparedness Summit, organized by the National Association of County and City Health Officials (NACCHO) and sponsored by a number of agencies and organizations, brings together a variety of players and partners to present research findings, share tools and resources, and teach attendees how to implement model practices to enhance the nation’s capabilities to prepare for, respond to, and recover from disasters and other public health emergencies. Over 1,800 people attended from all 50 states, as well as several countries and territories. Participants in the Family Reunification Tools Session. This is the fourth year that NLM attended and exhibited at the Preparedness Summit and the second year presenting sessions. This year NLM organized or participated in five sessions. “The Preparedness Summit is a unique opportunity for NLM to present our wide variety of disaster preparedness and response resources to the community that needs them. Public health officials are responsible for the safety of the general public, whether it is from contaminated foods, vaccine-preventable diseases, or any and all types of hazards,” says Stacey Arnesen, chief of the Disaster Information Management Research Center, Specialized Information Services Division, NLM. The NLM presentations ranged from an overview of NLM’s disaster information databases and apps to an emergency email communication system that works without the Internet. The two highlights of the conference were the interactive, hands-on session on family reunification tools and a virtual hospital incident command exercise, conducted with volunteers from the audience. Together Gill and Peterson introduced attendees to the ReUnite and TriagePic apps, which are tools to report (and search for) information related to missing or found people. These tools quickly report the information to corresponding websites. ReUnite interacts with PEOPLE LOCATOR for the public, and TriagePic works with the TriageTrak demo website for hospitals. Both apps can search their corresponding websites as well, using either text or a photo alone. Gerardo Galano, a public health nurse from the County of San Diego Emergency Medical Services, assisted Gill and Peterson in the demonstrations. Galano is considering using the tools, and clearly he is not alone. Though the session was limited to 20 participants, over 35 people attended. 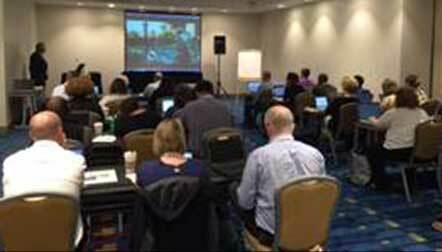 Another notable NLM session at the conference brought to life a disaster through a virtual hospital incident command exercise, conducted with volunteers from the audience and a virtual reality platform developed by Victor Cid, a senior computer scientist at NLM. The mock scenario involved the release of a toxic chemical in a Washington, DC Metro station. The response team had to plan for and handle the victims at the hospital by adjusting staffing, setting-up decontamination stations, coordinating security at the hospital, and more. Participants also used the NLM WISER/CHEMM app to identify the toxic chemical and the family reunification tools to report people missing as a result of the incident. A number of people participated in the virtual exercise, playing roles such as incident commander (Steve Peterson), financial chief (Mike Gill), operations chief, planning chief, and more. The exercise gave hospital and public health staff the much-needed opportunity to learn and practice the Incident Command System. The United States follows that system during disasters to coordinate the roles and responsibilities of disaster managers in various Emergency Operations Centers. 2015 Preparedness Summit participants conduct a virtual incident command exercise. Feedback indicated that both participants and observers greatly enjoyed the exercise, and they found it more helpful than traditional training methods, such as lectures or table-top exercises. Next year’s Preparedness Summit moves to Dallas, Texas. We hope NACCHO continues the interactive demo sessions and supports a computer lab for hands-on, learning sessions. July 13, 2015 in Programs & Services.